A GoFundMe campaign set up by his wife has already raised more than $13,000. 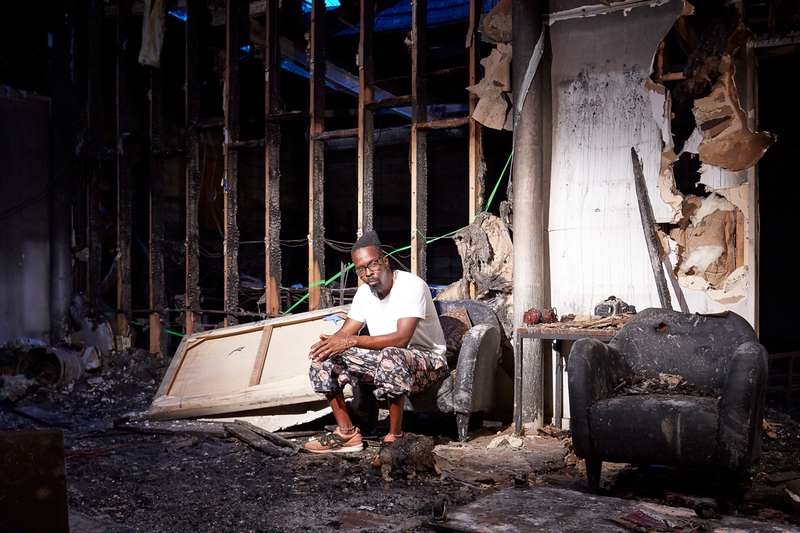 Fahamu Pecou sits in what remains remains of his studio after a fire devastated it on September 8. Last week, Atlanta artist Fahamu Pecou was vacationing in Cuba, on his way to a market, when he stopped at one of Havana’s many Wi-Fi parks to check his text messages. As soon as he was able to connect, his phone lit up one alarming message after another. Pecou had no idea what his friends were talking about. He called the person who sent that last message, Scot Dunn. 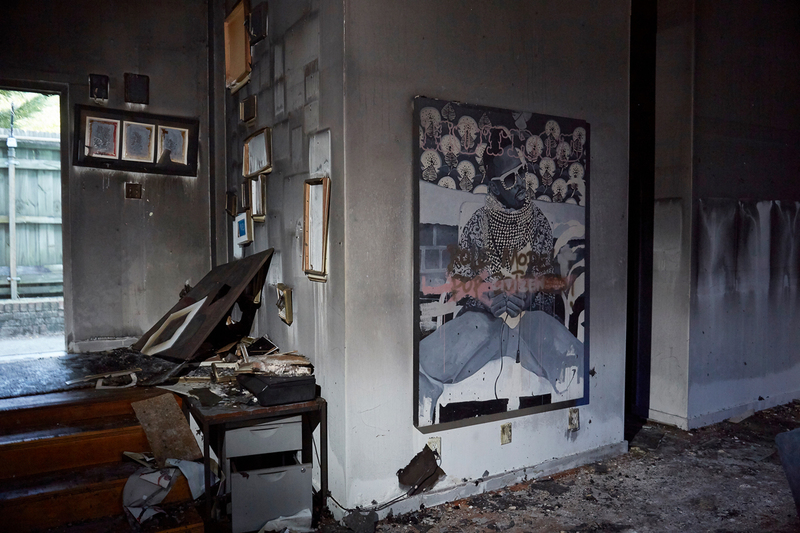 Dunn owns the Inman Park studio space where, for the past four years, Pecou had been creating some of his most magnificent work—paintings exploring African spirituality and “the ways in which we’ve become separated from our cultural memory,” which have appeared in exhibits in New York and Paris. Some of his earlier works can be spotted on screen in shows such as Empire and Black-ish. When Dunn picked up, he couldn’t contain his crying. A fire had consumed the entire building, which also housed Dunn’s own art studio, a reiki center, and a high-end hair salon, Cameo. Pretty much everything inside the building—located on Waddell Street just south of DeKalb Avenue and dubbed “The Waddi”—was gone. The following day, September 9, Pecou flew back to Atlanta, dropped his bags at home, and went straight to the wreckage. The “ghosts” of Pecou’s framed artwork are still visible on the studio walls. Pecou has dealt with loss before. Six years ago, several of his paintings that were in storage in New York were destroyed by Hurricane Sandy. The year before, his home was broken into and his computers and hard drives were stolen, meaning all of his records pertaining to his work up to that point disappeared. Infinitely worse is the fire he survived in 1980, when he was four years old. 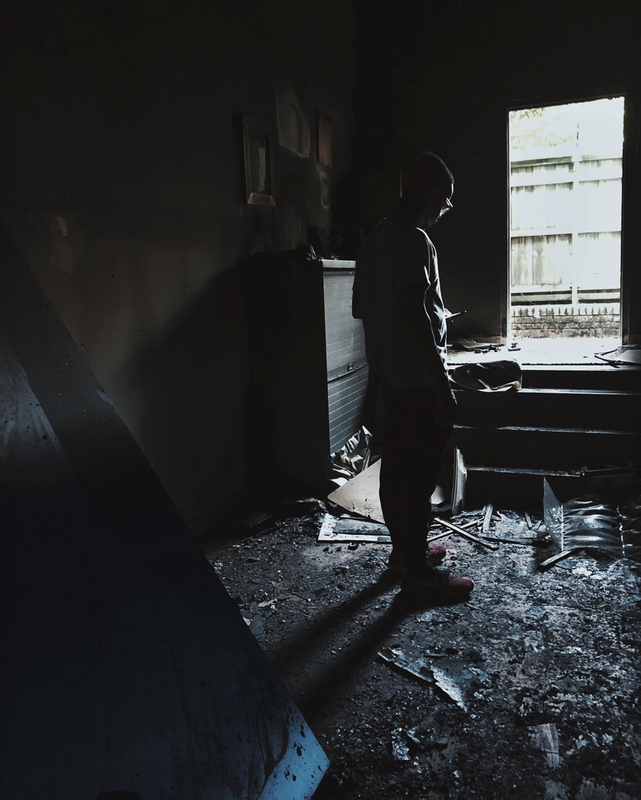 Inside the Brooklyn apartment where he lived with his parents and sister, his father, who’d been diagnosed with paranoid schizophrenia, killed his mother and set their home ablaze. He says all he knows for sure is that he’s learned to be good at starting over. After the hurricane and the burglary, Pecou began making it a habit to keep much of his work in off-site storage. Had he not done that, his loss this time around would have been much worse. His current touring exhibit, “Do or Die: Affect, Ritual, Resistance,” was also safe and will soon be transported from Charleston to Emory’s Michael C. Carlos Museum for a solo show that opens in January. 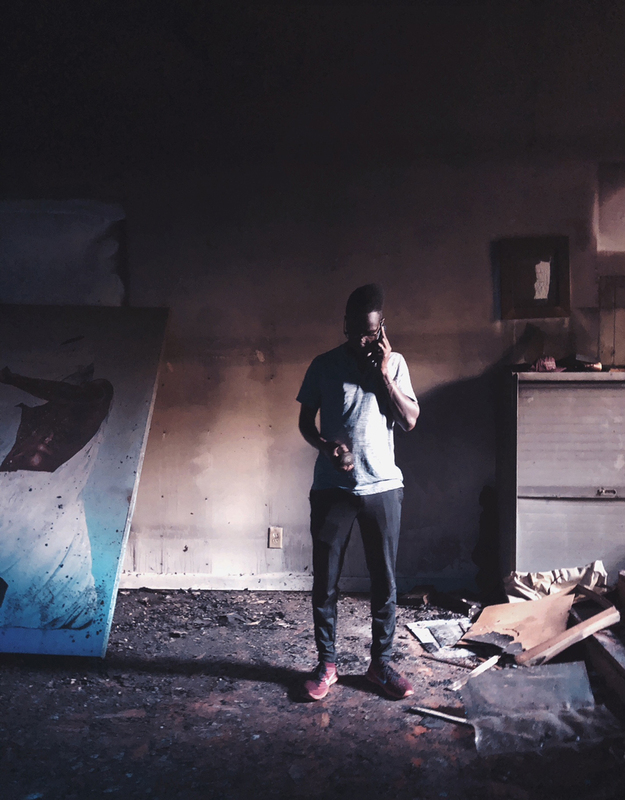 Still, the fire took nine of his paintings, all recent work that included three pieces he intended to debut at the Atlanta “Do or Die” show, and another three that had already been purchased by collectors. (The collectors have offered to wait for Pecou to recreate the paintings, for which he is grateful.) Also gone is some of Pecou’s personal art collection, including one of his favorite pieces: a portrait Brantley had done of the two of them. He currently estimates the loss of his paintings, the portion of his personal collection, and various supplies to be close to $100,000. Pecou had planned to spend Monday packing the three paintings to be shipped to the collectors. Instead, he spent the day sifting through the blackened remains of his space. Several large canvases that he had prepped for painting had fallen over and blocked the entrance to a small back room of the studio. 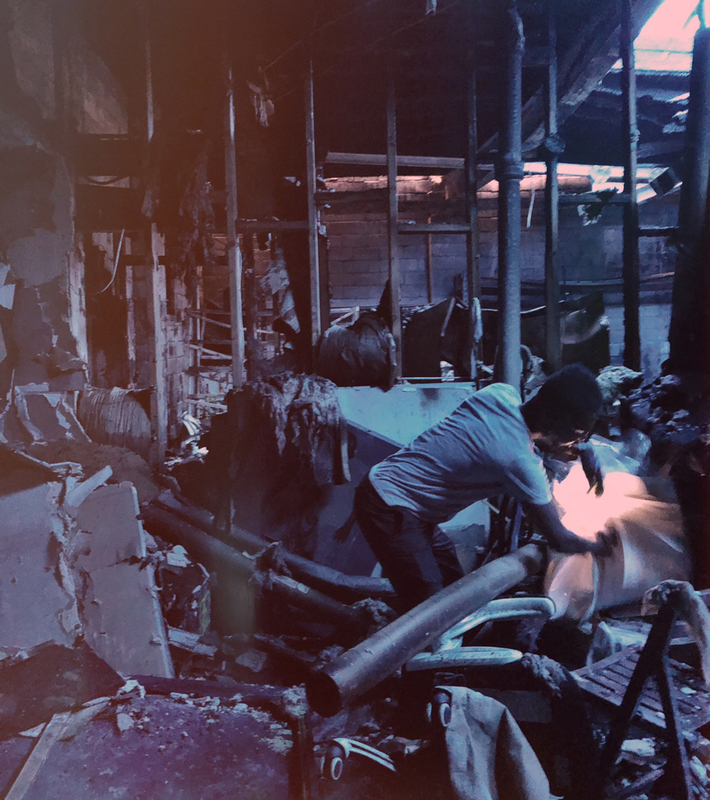 He was surprised, when he pulled the damaged canvases away, that they had helped protect that room, which housed two paintings that are relatively, miraculously unharmed. One of them, All Dat Glitters Aint Goals, was the one that appeared on Empire. The other, from 2006, is called Liberation and shows a man (Pecou) with his back turned and a woman embracing him while staring straight at the viewer. To help recover some of the losses, Pecou’s wife, Jamila Crawford Pecou, set up a GoFundMe. As of September 14, it had surpassed its $10,000 goal by $3,500.